My wife and I have renovated a number of houses together but until we bought a plot of land overlooking the Deschutes River we had not worked on new construction. Most of this project is documented in an Oregon Home article. The part that is not covered is the heating and cooling system. The house was built with many passive features to make it cool in the summer and warm in the winter. It is built on a thick slab of concrete providing substantial thermal mass, the roof overhangs the walls providing shade in the summer while the south facing aspect of the house is mostly glass allowing the sun to heat the floor in winter. We can open both the front and back walls of the living area at night, nights are cool and the thermal mass of the floor holds that coolness well into the day. As the Oregon Home article says we had great architects helping us and time to experiment so there are many ways in which the house uses the environment to stay comfortable is summer and winter. 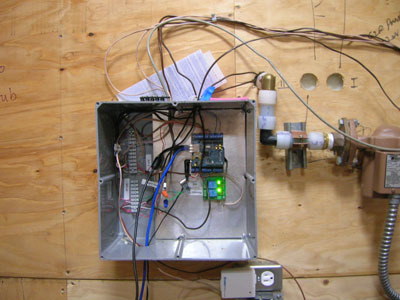 Image shows the arduino box on the left, hydronic fluid tank center, relay box just visible upper right and valves lower right. Directly manipulating the thermal mass of the floor is a good way to deal with the extremes of summer and winter in the high desert. Hydronic heating is common but examples of hydronic cooling are hard to find. The contractors we talked to were reticent to help because as one said “if you cool the floor below the dew point dew will form and your carpets will rot”. While this is good advice in damper climates it is very low risk with a house in the high desert. 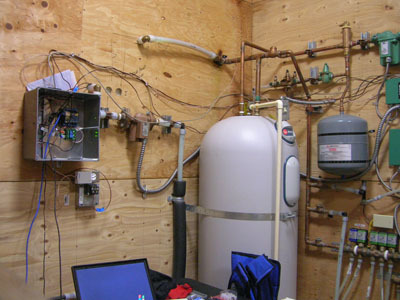 Several contractors did an excellent job of selecting the heat pump, reverse chiller, and control valves. When we moved in however the electronic side of the control system was a disaster and we were still struggling to find the parts to make the system work. The system we use now is built on an Arduino microcontroller. Arduino Box showing the Arduino Uno with Ethernet shield. 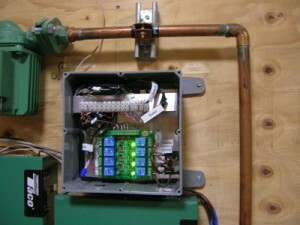 The green lights show the two relays used to shut down the heat pump controller and switch from heating to cooling. The Arduino system connects to the internet through an Ethernet shield and connects to temperature sensors in each of four zones through the Dallas Semiconductor 1-wire protocol. Similar sensors measure hydronic fluid temperature at the heat pump and in the floor and outside temperature. A set of relays control the Taco zone controllers that then control the zone valves. The controller is programed to operate autonomously but checks a website for instructions every 30 seconds. This allows the heating of cooling to be turned on remotely an important feature when the objective is to alter the state of the thermal mass of the floor. We have been running this system successfully for six years and it is able to cool the house to 68C on a 110C day and heat it to 68C on a 0C day. If others plan to tackle a similar challenge I will be happy to share more information, layouts, and code. Thank you to all who participated in today’s (January 18, 2011) event. Please feel free to comment on the day and suggest next steps.